BACKGROUND: Meet Canada’s first ‘Ultra Low-Cost Carrier’, a form of airline that is popular in Europe but is new to Canada. Flair is based in Edmonton, Alberta and operates scheduled passenger service as a low-cost carrier to secondary airports in or near major Canadian cities. 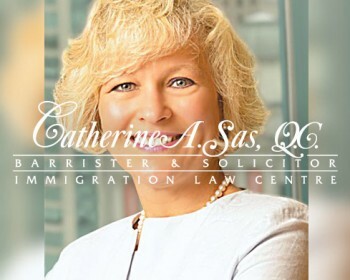 It also operates chartered passenger and cargo services in Canada, the United States, the Caribbean region, and to destinations worldwide from its main hub, Edmonton International Airport. OUR WORK: Flair Air is dedicated to providing value to its customers through affordable air travel. Flying within Canada is often more expensive than flying internationally – a reverse of what citizens from most other countries experience. 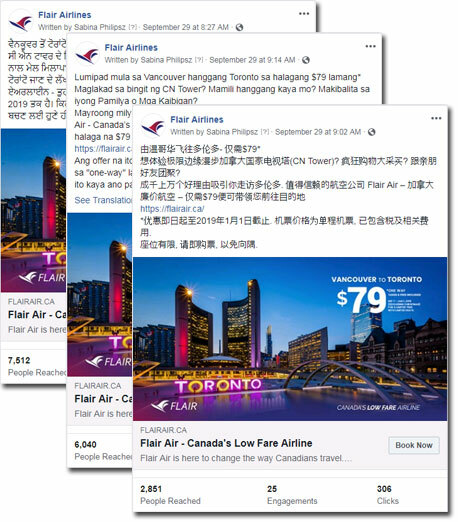 As part of its effort to make airline travel accessible to underserved markets such as to new Canadians, Flair is working closely with our Vancouver multicultural marketing team on a series of in-language digital campaigns that promote the airline’s travel deals and its brand in Chinese, Punjabi, and Tagalog. Our digital marketing team provides a number of services including translation, graphic design, copy recommendations, digital execution, conversion tracking, split testing, and reporting.